If you use Office on the Mac, this book is for you! 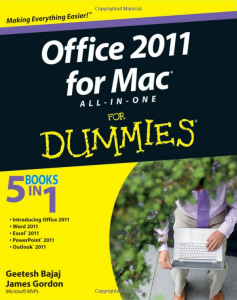 Office 2011 for Mac All-in-One For Dummies covers Word, Excel, PowerPoint, and Outlook. It’s by two MVPs (Most Valuable Professionals, a Microsoft award for experts who contribute to the the technological community in their field). James Gordon is a Mac MVP. (yes, Microsoft actually has a couple of those!) Geetesh Bajaj is a PowerPoint MVP, owner of Indezine.com, one of the best PowerPoint resources around. If you’re not familiar with All-in-One For Dummies books, they’re thick! This one is over 800 pages. I’ll stick to Book IV, which is the PowerPoint part. Chapter 1: Profiling PowerPoint’s Interface. Here you’ll find all the introductory material, such as templates, different views, transitions, slide timings, preferences, and notes pages. Chapter 2: Opening and Saving a Presentation. This chapter includes ways to protect a presentation. Chapter 3: Feeling at Home on the Ribbon. This chapter sounds like it’s about the interface, but actually covers a lot of the basic features of PowerPoint, including slide layouts, formatting text, inserting content, aligning objects, and adding tables. Chapter 5: Designing Masters, Slide Layouts and Themes. This excellent chapter shows you the underbelly of how PowerPoint works, explaining slide masters, custom layouts, customized handouts, and creating your own themes. Chapter 6: Applying Animation. All the basics of animation are in this chapter, including motion paths. Chapter 7: Delivering Your Presentation. You’ll find some great advice and recommendations for excellent delivery here. There’s a clear description of Presenter view, which shows the presenter notes and upcoming slides. You’ll also find information about recording, broadcasting (new for 2011), custom shows, and more. Chapter 8: Printing, Sharing, and Coauthoring Presentations. Learn about printing and distributing presentation in various formats, including video. There’s some excellent content about collaboration with SkyDrive or SharePoint. This book is an excellent reference and I highly recommend it. Ellen, I have just purchased Office 2011. Can you tell me which ones of your recommended resources will actually work on a Mac? I spent money on some early programs that were only workable on Windows. I would like to own more of your recommended resources but only oif they work on my Apple machines. I found it tedious to w=switch over to the Dark side of my duo prod=cessor just to use a PPtool. My ebooks and courses were all done on my PC. Some of them are more general, such as Lost Art of Persuasion (an ebook), 19 Steps to Prepare for a Successful Presentation, parts of Slide Design for Non-Designers, and most of How to Prevent Death by PowerPoint with Instant Makeovers of Your Slides (webinar recordings). You can look through my e-store (if you haven’t already) at http://www.ellenfinkelstein.com/ppt_estore.html. If you’re interested in software, let me know which ones and I’ll try to check them out. I would say that there aren’t a lot of add-ins that work for PowerPoint 2011, although here’s one by Jim Gordon for inserting multiple images: http://www.officeformachelp.com/2011/01/insert-picture-for-powerpoint-2011-add-in-now-available-for-purchase/. Do a search on PowerPoint 2011 add-in or plug-in and see what you find. Good luck!